The Regional Experiment of CarboEurope-IP will produce aggregated regional estimates of ground based data that can be meaningfully compared to those from the smallest downscaled information of atmospheric measurements and continental scale inversion results. 3.1 To determine the spatially explicit regional balance of CO2 over an area (300*300 km) in South West France at a typical model grid resolution of 2 km every day during a full year based on atmospheric and ground based measurements (MO2, 4, 8). 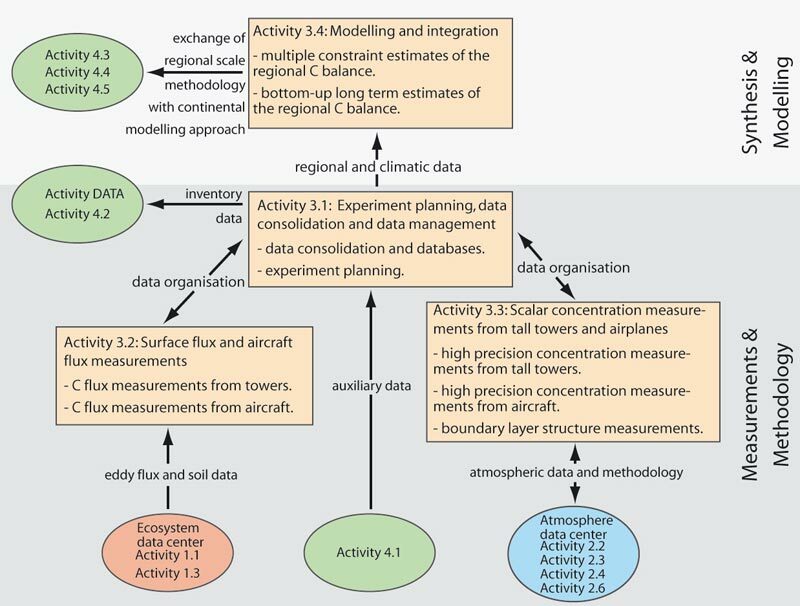 3.2 To provide combined datasets of concentrations, fluxes, and remote sensing, with the highest possible density for developing innovative downscaling and upscaling methods to quantify the carbon balance of the target region within a multiple constraint framework (MO3). The central methodology of the experiment is to make both concentration measurements within and above the boundary layer and to couple those via a modelling/data assimilation framework to the flux measurements at the surface and within the boundary layer. This multiple constraint approach has not been tried before (e.g. HAPEX-Sahel, Boreas, Fife ) because in these experiments atmospheric concentration measurements were not made. We will apply the multiple constraint method for the first time in a regional experiment. The advent of small specialised aircraft in the past decade, measuring fluxes at a resolution of 1 tO2 km and with comparable accuracy to tower fluxes, has greatly increased the possibilities to provide accurate estimates of spatial heterogeneity. Also atmospheric mesoscale models are now powerful tools to study regional CO2 exchange (e.g. Dolman et al., 2003). This development has been further taken up in Recab, so that non-hydrostatic mesoscale models can simulate the surface-atmosphere exchange of CO2 at resolutions comparable to that of flux aircraft and single flux towers (e.g. 1-2 km). For such transport models applied to a limited area, the boundary conditions will come from atmospheric coarser scale models used in the Continental Integration Component. A prime requirement to successfully use high resolution meso scale models for CO2 inversion of sources and sinks is the existence of accurate a priori flux distribution and high resolution spatially and temporally distributed map of fossil fuel sources. Realistic mapping of the surface fluxes relies on information on land cover, and surface biophysical parameters (LAI, albedo) that can be obtained from high resolution (e.g. Landsat, Spot, Aster) and high repetitiveness (e.g. Vegetatio, Modis, Meris) spaceborne images. In addition to high resolution atmospheric transport and inverse methods for determining surface CO2 fluxes, we will also use high resolution flux modelling. The atmospheric mesoscale transport models are fitted with land surface packages (SVAT) and are excellent tools to act as a host platform for data assimilation of field and model data. In order to separate the anthropogenic sources of CO2 in the target region, we will collect continuously high precision samples of radiocarbon ( 14CO2) which can unambiguously trace fossil fuel emissions. Wherever possible, based on the Atmosphere Component results that will deliver a ”calibration” of CO versus 14CO2, we will use CO as a tracer to eliminate the influence of anthropogenic CO2 advected into the area. We will prove the concept iN2004 by a re-assessment of the Recab results, we will have an intensive test campaign iN2005 to study the effect of heterogeneity and plan a one-year experiment. We will have a one-year, strategically focused high intensity experimental campaign (Extended Observation Period, EOP) iN2006. The last two years are for integration of data and results. 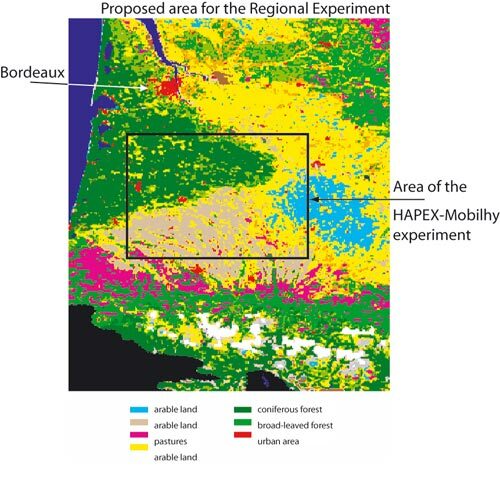 The area chosen for this experiment is in South West France including the ”Les Landes” forest, the city of Bordeaux and a large agricultural area to the East. The area for the regional experiment is shown in Figure 11. The area is chosen because of the good contrast of atmospheric scalar concentrations between sea and land, several large areas of homogeneous land cover and existing high-resolution databases and extensive modelling experience of CNRM (Météo-France) in Toulouse . This allows to develop the methodologies for regional carbon monitoring in a relatively simple, well-defined area with excellent data coverage. We will install a set of ground based surface flux measurements, extra radio soundings and wind and temperature profilers and perform aircraft measurements with low flying flux aircraft, perform boundary layer sampling with small commercial aircraft, and perform longer trajectories with a research aircraft. At the in- and outflow boundaries of the domain we will install at one to two tall towers high precision measurements of CO2 and 14C. The Intensive Observation Period (IOP) of 4 weeks in the summer of 2005 will have high intensity observation of boundary layer development and extra flux aircraft for enhanced spatial sampling. The high temporal resolution will allow us to better parameterise our models to deal with rectification effects. We envisage the deployment also of an extra low flying aircraft with a remote sensing platform in the Test Campaign, that will enable us to assess the spatial heterogeneity of the area in greater detail and will provide important data for use in improving and testing future and current satellite retrievals. This set-up will be used to close the top down atmospheric carbon balance of the region. We will apply also bottom up modelling to account for the slowly varying processes. To have a set of driving variables of surface weather, we will produce a downscaled synoptic weather analysis at 8 km resolution by CNRM, Toulouse . This allows the use of biogeochemical models to produce bottom up estimates periods of up tO20 years at the resolution of the land surface characterisation (1-2 km). The organisation of the Regional Experiment through different Activities, and their main objectives is shown in Figure 1. Figure 1 also shows the interaction between the activities in Component 3 and the other CarboEurope-IP Activities. Component 3 is an important intersection between all Components with regard to data input (Components 1 and 2) and modelling and data assimilation (Component 4). The Regional Experiment Component will provide a multiple constraint estimate of the regional carbon balance at 2 km x 2 km resolution for 2006 based on a data assimilation system. This innovative data assimilation systems will be capable of assimilating land surface, remote sensing, atmospheric data at regional scale. We will also extend the time frame of the one year analysis with bottom up estimates of the regional carbon balance at typically 2 km x 2 km resolution to the period 1980-2005. To provide these data assimilation activities with the required input data we will collect datasets of concentration of CO2 and trace gases in the boundary layer, flux estimates of small towers and aircraft and various supporting data fields of biophysical characteristics and soils and biomass inventories. To provide a framework for an observation system, that is capable to derive a regional carbon balance from a limited set of observations and from modelling. Figure 2: Land cover map of the area for the Regional Experiment of CarboEurope-IP derived from SPOT4/VEGETATIO at 1 km resolution and the Area of the HAPEX Mobilhy experiment.